I think that everyone should include a concentration camp on their list of places to see in this lifetime. Arguably the most infamous is Auschwitz (OWSH-vits), which lies about 50 miles outside of Krakow in the city of Oswiecim (ohsh-VEENCH-im). 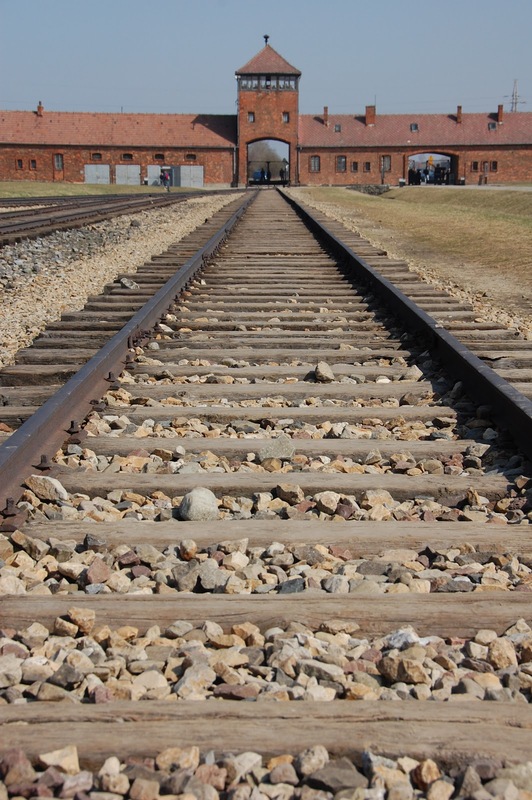 The name of the camp is merely the German version of the Polish city and refers to a system of camps, including: Auschwitz I (with the "Arbeit Macht Frei" gate), and Auschwitz II which is also known as Birkenau (BEER-keh-now) and includes a famous guard tower with train tracks. I've been to other labor camps such as Dachau and Buchenwald, but they are very different from the extermination camps here. 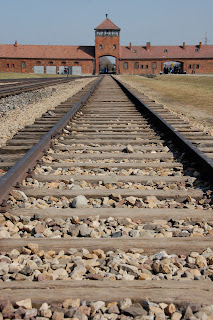 Auschwitz operated between 1941 and 1945 and was the site of the systematic murder of at least 1.1 million people; mostly Jewish, but also political prisoners, Roma (gypsies), homosexuals, and others deemed impure or harmful to the Nazi regime. This post is meant to give an idea of the layout of the camps and the atrocities committed there. "Arbeit macht frei" - Literally "work makes free" was the false promise that greeted prisoners at the gate of Auschwitz I. The original sign was actually stolen two years ago by some people that wanted to sell it. It was reclaimed and is now in a museum, so this is actually a replica. Notice the intact brick buildings that served as the barracks for prisoners. This camp could hold 14,000 prisoners at one time. This map in one of the barracks gives a visual of where the prisoners came from in Europe. At a glance you can see that they came from as far north as Norway, as far west as France I think, as far south as Hungary or Yugoslavia, and as far east as Russia. Standard bathroom in the barracks of Auschwitz I.
Sinks/washroom in the barracks of Auschwitz I. Much of this camp was preserved, unlike other camps you may visit which were leveled except for a few buildings. The barracks of Auschwitz I all house various exhibits - this one with several large cases filled with leather suitcases and bags that were taken from prisoners as they arrived. They were told to pack up their belongings for "relocation" from the forced ghettos in their home countries/cities to these new locations. The Nazis stole all of the personal belongings upon arrival and used them for the war effort when possible. Shoe collection rivaling that of the Washington DC Holocaust museum. In this courtyard between Blocks 10 and 11 several thousand prisoners were shot. In the building to the right many people were put on "trial" (lasting a few minutes) then executed or put into starvation cells or standing cells (no bigger than a phone booth) for hours or days with three other people. The gas chamber/crematorium at Auschwitz I could kill 700 people at a time. Soldiers locked the doors on the outside, then dropped pellets of Zyklon B poison gas into the chamber and sealed it off. It would take 20 minutes to kill everyone and another two days to burn the bodies. This "inefficiency" led to the construction of Auschwitz II, aka "Birkenau". Used canisters of Zyklon B.
Pellets of Zyklon B that could be weaponized when heated up past room temperature. The commander of the camp, Rudolf Hoess, was tried and convicted after the war and sentenced to death. Survivors asked that the sentence be carried out at the camp, directly between his house and the crematorium. Entrance and guard tower for Birkenau. Prisoners rolled right through those gates to the platform that would decide their fate. On this platform the new arrivals would immediately be sorted into those that should be immediately sent to the gas chambers and those that should be worked to death in the factories. Prisoners at Birkenau didn't have sturdy brick buildings in which to live. Rather, they lived in pre-fabricated horse stables with rudimentary bunks like these that they shared with multiple prisoners. The bedding typically consisted of straw or hay. Most of the barracks were torn down, but the chimneys remain, giving you an idea of the scale of this camp. 100,000 prisoners could be held here at one time. This memorial was constructed for the victims of Auschwitz during the Soviet era in 1967 (in the Social Realist style) and is meant to resemble gravestones and a chimney, with plaques in multiple languages along the front summarizing the atrocities committed here. The large-scale gas chambers were dynamited by the Nazis when liberation by the Red Army was eminent. The ruins were kept as evidence of the mass-murder. Prisoners were ushered to the end, asked to strip down and were given locker numbers for their personal belongings. Then they were marched down to the "shower rooms" for "disinfection". The same technique was used to kill the prisoners as in Auschwitz I. However, this chamber (in addition to one just like it 100 yards away) allowed for the extermination of 4,400 people per day. The bodies were quickly cremated and the ashes scattered into a lake. Auschwitz was liberated on January 27, 1945 by the Soviets. 7,500 prisoners were rescued, of which about 20% died of disease and/or starvation afterwards. The Polish government voted to turn this place into a museum so that no one would forget about the events that took place here.